Having had some time to think over Neil Gaiman’s words in the speech I reblogged earlier, I’ve been able to narrow down things he said that gave me hope. He said he never had a career plan – nothing aside from a list he wrote when he was about 15 of things he would like to do during his life. Sounds a little like my plan. But while his list consisted of a few different things – writing a novel, a comic book, a movie etc, mine really only has one – write novels. One after the other, after the other. I’ve never really been one for planning. When asked where I hope to be in the next 5 years I always think “How can I know? Who knows what may happen in that time, what opportunities may arise.” That has changed a little since having children and gaining a mortgage, and I should say, committing to being a writer. I can now say, in 5 years my children will be x age, and both at school, so I will have more free time to pursue my writing. My mortgage I want paid off as soon as possible and so I’m working towards that too. I once read something Sara Douglass had written – about having the perfect life – she worked for I think it was 7 or 8 months of the year – getting out one book (or it may well have been two I can’t remember exactly now – someone else out they may have read/know this? ), which gave her an advance to budget off. Any further income was simply icing on the cake. This lifestyle also gave her the remaining 4-5 months of the year to focus on her other passion – becoming self sufficient. This lifestyle sounded (and still does) brilliant to me. It gave me a concrete idea of something I’d like to work towards. But this idea is the only ‘plan’ I have. It is no more detailed than Neil Gaiman’s list. Another thing he said was that the things he sent out that he was not certain about always surprised him with how successful they were. I know I have sent many many stories to competitions over the years – over confident, certain of success, only to be disappointed. 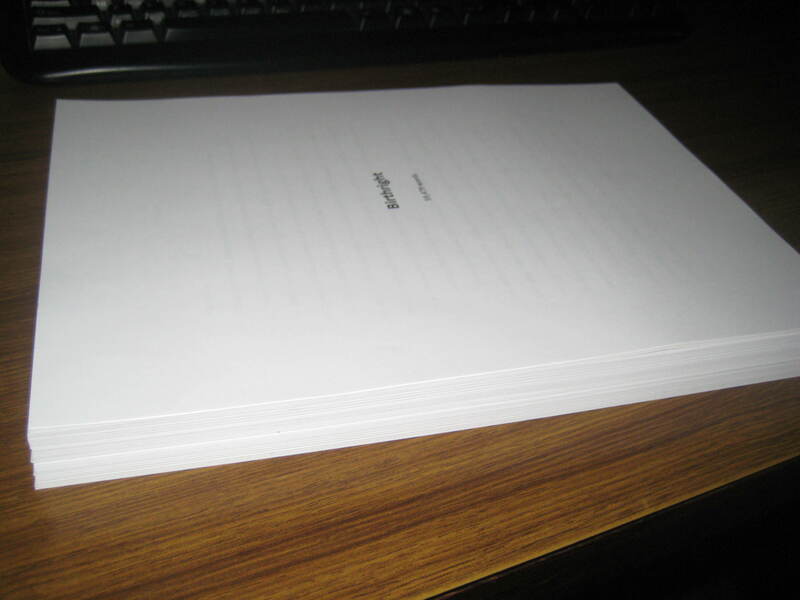 I am about to submit my first novel (not the first one I have written, but my first submission to a publisher). The novel is okay. It has some bits I am really proud of – sentences I highlighted during the editing process and gave a great big tick. But for all the work I’ve put into it there are still sections I wonder about – could this be improved? Could that be extended? Maybe the story would be more interesting with a few changes here or there? But I can’t spend forever ‘fixing’ it, for I daresay it will never reach perfection and instead would spend forever hiding in my home, preventing me from working on new stories. I hope I haven’t lost you along the way. This post seems to have been a bit of a babble. Thanks to everyone who’s stayed with me this far! There’s one more thing I’d like to say about my novel. It’s printed (one massive stack of paper there!!) – all it needs is one last skim for spelling/grammer errors, and I will send it off.